All this week I’ve been writing down all that knowledge I aquired in my last nearly 4 years at work to pass it on because today is my last day at work. But actually my mind is set on travelling or rather packing at the moment. Yesterday I put together a collection of things that I want to take to Thailand. I was told only to take two pairs of shorts, two t-shirts and two bikinis (ok and underwear too, of course), wearing a long sleeve and a hoody and long trousers for the flight (what I’ll definitively do). 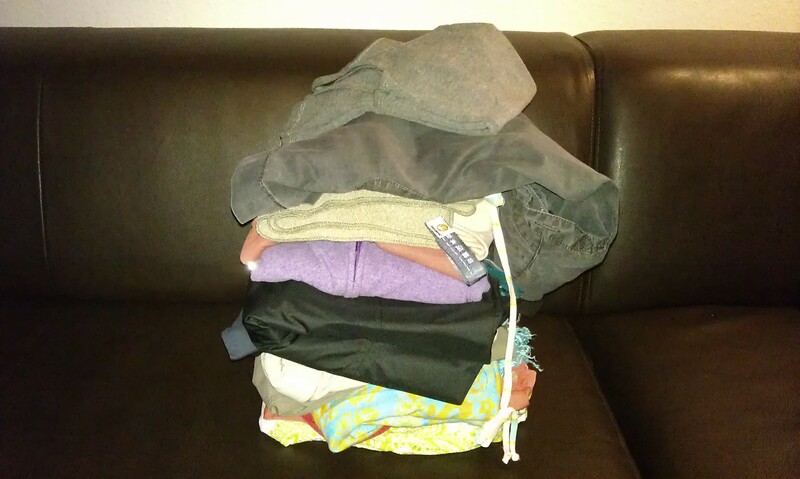 But I think, I’ll take a bit more like my two long dresses and and maybe four t-shirts instead of two… But at the moment the pile is a bit high. I’ll have to sort somethings out again. Michael has not packed his things yet. He has been sick the last days but we hope he’ll be fine today, so we can figure out what we haven’t packed yet, what needs to be washed, bought or given to friends during the time of our trip. This entry was posted in At home and tagged Travelling by kathatravelling. Bookmark the permalink.